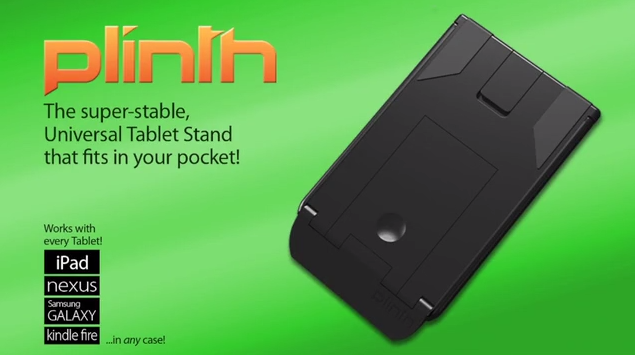 Plinth is an interesting looking little pocketable stand for the iPad and just about any other tablet. It’s a Kickstarter project that’s about half way to its funding goal with a little over a month left to meet its target. It’s notable mainly because of its (very) small size and due to its being touted as a ‘universal’ tablet stand. It looks cleverly designed – folded down it fits in a pocket and is roughly the size of an iPhone; it uses ‘flip out wings’ and rubber feet to provide its stand capability. I’ve used a few very small iPad stands in the past. Some, like the Twelve South Compass Mobile Stand, have been very impressive. Others have been OK, but lacked a little in terms of stability. The Plinth looks good in its trailer video. I may try to get a review unit at an appropriate stage of the project – as I’m always on the lookout for good iPad and tablet stands. Take a look at the Plinth Kickstarter page and see what you think of this versatile little stand. One of the key reasons I designed the Plinth was because when you use it all the time, several times a day, in all sorts of locations, stands like the twelve south compass become a pain to set up. It is also very big (wouldn’t want to put it in your pocket!) and heavy. At 50g and the size of an iPhone 4, Plinth is tiny. And at the touch of a button, it’s there. Pop!